Plum Blossoms, originally uploaded by domesticchicky. Lilacs, originally uploaded by domesticchicky. I am really enjoying this wonderful weather, and trying to get my voice back (ugh-will this cold season never end?!?!?). Spring cleaning this weekend, and my sewing machine is out and ready for action…Look for some new links next week, a couple of really good cookie recipes, and a giveaway!! 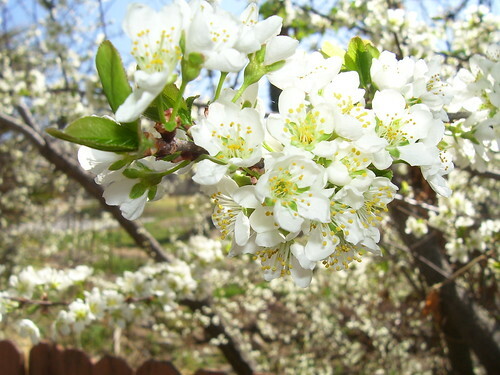 For now, enjoy the plum blossoms and lilacs in my backyard…I am! Awesome photos….and flowers too of course! That first photo… the plum blossoms… insanely great photo! AND I completely adore your banner! These posts are just cruel for those of us on the east coast digging out from a nor’eater. But I’m happy for you. Mostly. My plum tree gets removed this year. Would love to ship it your way, lol. So pretty!!!! You bring me hope that someday our snow will melt and spring will come. Every time it melts more arrives!!! ooh those are GORGEOUS pictures! those flower pics are gorgeous! i’ve been taking pics like that like crazy lately! the colors and the scents and the anticipation of spring is overwhelming! your pics come in handy on a craptastic rainy day here in silicon valley. thanks! Those are gorgeous. I bet they smell heavenly.